The weather in the county of Northamptonshire is consistent with what one can expect in the UK although it is generally milder and the country-side is magnificient making it ideal to come for a golfing break. Northamptonshire is located in the heart of England and is easily accessible from all parts of England. The county is considered one of the best regions for playing golf. There are many golf courses around the town of Northampton, which an enthusiastic golfer traveling to the area might be interested in. Featured golf courses in and around the market-town of Northampton include Brampton Heath, Wellingborough and Northamptonshire Country Golf Clubs. 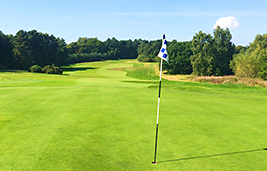 Brampton Heath Golf Centre is set on undulating heathland sitting on very free draining soil. This allows play all year round, always with golf trolleys and never on tee mats. The greens play very true at all times and the fairways are arguably considered the best in the County. There is an 18-hole main course and a 9-hole short course. The main course is constantly improved every season through the construction of new tees, hazards such as ditches and mounds, and an extensive tree planting programme. The course provides a fair test for players of all abilities. Brampton Heath has hosted both the Boys and Seniors County Championships, in 2002 hosted the N.G.U. Hollingsworth Final – the County’s premier team event. In 2010 hosted the NGU Junior Inter Club competition along with two Northamptonshire PGA PRO-AM events. The short course is ideal for new players to gain confidence before tackling an 18 hole course and also for experienced golfers to work on their short game. Wellingborough golf course is considered a very fine par 72 course of over 6,700 yards set in quiet parkland. This is considered a testing course for golfers of all abilities. There are three holes in particular with their own challenges. The fourth hole is a 166-yard par three, which is played over water. The eighth is a short dogleg, which needs a tee shot over or around the trees to the left of the fairway to give the best line into the green; and the 18th, another short par four but with a bunker on the right. Non-members are welcome and must pay their green fees before commencing play. Northamptonshire county Golf Club borders the Althorp estate and is set in the village of Church Brampton. For many years the course has been used as a regional qualifying venue and has staged the British Girls Open Tournament and the PGA Seniors Club Professional Championship. This is a traditional course with a mix of heathland and parkland. Northamptonshire golf course now has 21 holes. The opening hole is one of its toughest at 454 yards. The fifth hole is also quite tough. It is 438 yards and is played uphill with a fairway sloping right to left. The 15th hole has a river to the right. Buggies are available to hire and the golf course is open to both members and non-members. This course offers a great golfing challenge any time of the year as it drains very well during the winter months. If you are visiting Northampton soon and are looking for accommodation in Northampton , know that you have many options to choose from. You can visit Cotels Serviced Apartments for more information regarding accommodation in the area that’s near the Northampton golf course you are visiting.